From vintage Pirate Cuban cigars to Mahroosh hookah flavours and packets of original Camel, king-size Royal Classic & more…score ’em all at Zoya Sheesha at Viman Nagar, near Bishop’s school. 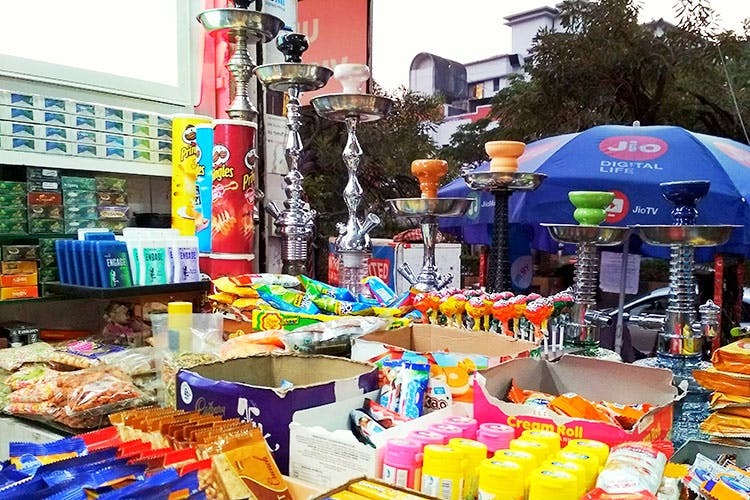 What started as a small roadside tapri by Ashraf 12 years ago, is today, one of the most sought-after shops in Pune that sell international brands of cigars, cigarettes, hookah flavours, rolling paper and much more. Now, we don’t support smoking or addiction of any sorts, but as storytellers, we were taken aback by Ashraf’s proud and fancy collection of over 500 products. Priced between INR 200 to INR 1,500, we found Middle Eastern cigarette brands such as Kings & Lords and Royal Classic. You can also find original U.S. & British American brands like Camel, Virginia Slims, Wings, Dunhill, Davidoff and Marlboro, out here. Hookah flavours are in abundance at Zoya’s. From cherry to gum, green apple, blue melon, banana, paan, keri, strawberry and even sangria, you name it and you’ve got your favourite flavour! Starting at INR 120, we found brands such as Smokfroot, Al Fakher, Mahroosh, Aladdin, Arabian Nights and Al-Marrakesh, all under one roof. What’s more? This perhaps the only store in Pune that sells rolling paper by Stash Pro, O’Sheish and GoGo. Also, don’t forget to check out their exquisite collection of sheeshas, hookah pipes and bongs, big and small, ranging between INR 300 and INR 1,700. We highly recommend you check out the assortment of branded dark and white chocolates, jellies, lollipops, candies, munchies, mints, chewing gums and more. Zoya’s also houses Middle Eastern perfumes and scents for men, starting at INR 250.